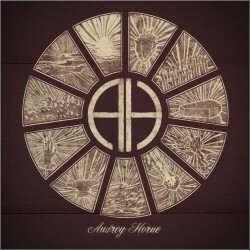 This self titled album is already the third album of Norwegian band Audrey Horne. Audrey Horne started as a band consisting mostly out of members of Sahg and Enslaved. Since the start the line-up has shuffled a bit, just as their musical style. Audrey Horne started as a rock band with some metal influences on their debut album No Hay Banda. On the follow-up Le Fol the metal influences were slowly making room, for more rock orientated influences. On this self titled album the transition is completed, so you can expect more rock orientated (with some grunge like influences) metal. The metal influence is even almost non-existent. The grunge influences are most apparent in the vocals of Torkjell Rod. He has the same melancholic tone of voice that separated grunge vocalists from their contemporaries. Besides that, the guitar play has also a bit of those dragging filthy rock chords, which emphasizes the whole melancholic feeling. There´s a lot of variety in pace on this album. Where ´Charon´ and ´Circus´ are more uptempo (‘Circus’ reminds me a lot of the earlier work of Finger Eleven, this similarity is also present on more songs), where for example ‘Down Like Suicide’ is slower and ‘Sail Away’ and ‘Godspeed’ are almost ballad like. Both songs are also the biggest surprises. Rock and metalbands burning their fingers on a ballad are common, but Audrey Horne are executing both songs to perfection. Especially the Beatles like ‘Godspeed’ is an excellent song to end the album! I must say that it took me more time to get into this album compared to the previous two, but now I have grown into it I must say that it’s just an excellent album. They didn't disappointed me at all, though I still prefer their more heavier side, but that’s a minor point of criticism. People who liked the older work of Audrey Horne can easily purchase this one and people who don’t know them but are into the more heavy rock, please check them out you won’t be disappointed!